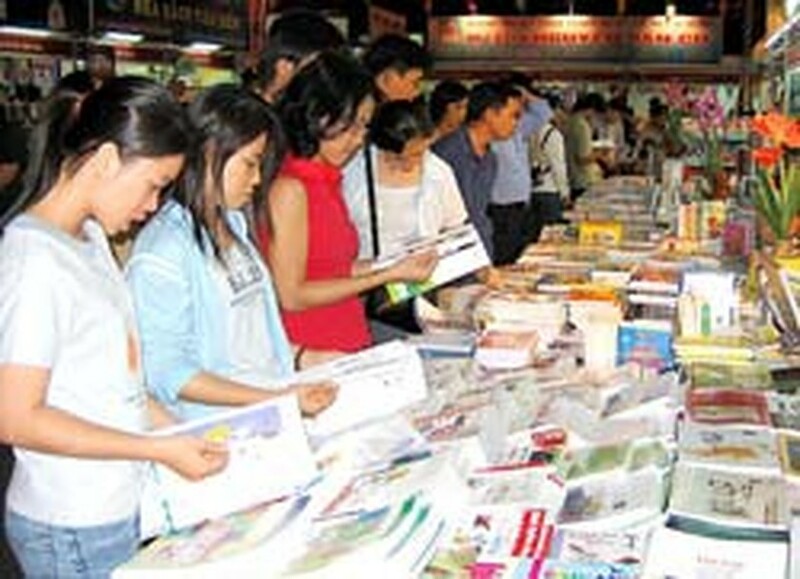 It has been announced that the 5th Annual Ho Chi Minh City Book Fair will be held from the March 10-16. It is believed to be the biggest book festival ever and has assembled 126 participants with more than 300 stores. This is twice as many participants as the previous year. Book fairs are a good chance for publishers to promote their books. There will be many advertisements, introducing the cultural reading activities and a number of related conferences and exhibitions in the book festival this year. The most significant event may be the award ceremonies for “The Golden Book” and “The Family Bookshelf” held by a General Publisher and an Art Publisher, respectively. Besides the activities, painting exhibitions of well-known Vietnamese artists, like Nguyen Gia Tri, Bui Xuan Phai, Nguyen Tu Nghiem, Nguyen Sang and Duong Bich Lien will also be a feature of the festival. Conferences with interesting topics like “Orhan Pamuk: A Look from the East and the West” and “From Copy Rights to Exploitation” will also be held. Writer and journalist, Vo Phi Hung will talk about “Cultural Life in the Alleyways”, while culturist, Huynh Ngoc Trang will discuss “The Culture of Green, Amber and Red Lights”. Also, for this occasion, the website www.sachhay.com will be launched and provoke an intriguing topic: Do Vietnamese People Love Books? Each publisher will promote their best books during the festival. The Young Publisher Group will present the latest work of writer Nguyen Nhat Anh “Dear childhood, give me a ticket”, and "The Ways of Light: Physics and Metaphysics of Light and Darkness" by Professor Trinh Xuan Thuan who was awarded the Grand Prix Award by the French Academy. Phuong Nam Culture Company will introduce “The Kiss of the Reaper”, a book adaptation from the movie, while Arts Publishing House will present “The Writer Returns Home” by Nguyen Quang Sang and “Women” by Ly Lan. In addition, Kim Dong Publishing House will attempt to repeat last year’s successes by launching a book for children titled “The Chronicle of Darkness”. The 5th Annual HCMC Book Festival will hold many discussions between popular writers and their fans. Writer, Nguyen Quang Sang and Ly Lan will have a friendly chat with the book lovers while Kim Dong Publishing House will hold another meeting between its translators, editors and the readers over the discussion topic of “Miraculous Literature for Children”. Another event organized by the Phuong Nam Company will be between the actors Thanh Loc, Hong Anh, Bach Tuyet and the readers. www.sachhay.com will run a show called “Stars and Books”, with the appearance of Thanh Loc, Quyen Linh, Hong Anh, Ho Ngoc Ha and My Tam. Creating even more excitement are the online meetings of the writers, poets and musical composers, Nguyen Thu Phuong, Phan Hon Nhien, Vu Dinh Giang, Luong Ngoc Ha (aka “Ha Okio”) and Professor Trinh Xuan Thuan. With these kinds of interesting activities, the 5th Annual HCMC Book Festival promises to be the best place to celebrate the reading culture of the people of Ho Chi Minh City.